Implant dentistry has evolved over the years. Well-defined research in this area has led to the successful and predictable nature of implant dentistry. Restoration of lost function, aesthetics, and harmony of dentition is the primary intention of implantology. It is achieved with a sound crestal bone stability and healthy periimplant soft tissue. The periimplant area primarily comprises the crestal bone and the healthy soft tissue around it. They are considered necessary for the long-term success of implant-supported restorations. If these two parameters are respected, implant therapy can be a reliable treatment with an impressive outcome. The primary function of a soft tissue barrier around implants is to achieve an effective and protective barrier that protects the underlying bone and prevents access for microorganisms and their products. A soft tissue seal, with structures similar to teeth with a true connective tissue attachment to the implant may improve this protective function. Periimplant soft tissue acts as a transmucosal seal. It resists recession and enhances an ideal aesthetic blending, and provides a prosthetic-friendly environment to withstand the mechanical challenge and appropriate contours for a self-cleansing environment. The interface between the implant and the mucosa comprises an epithelial tissue component and a connective tissue component. The epithelial part is called barrier epithelium and resembles the junctional epithelium around the teeth., It was reported that basal lamina and hemidesmosomes occurred 2 weeks after implant placement. Functional similarities have been found between the gingival mucosa and periimplant mucosa. Collagen type I is the main constituent part of the supracrestal connective tissue of the periimplant mucosa in human biopsies. Furthermore, gingiva and periimplant mucosa have shown similar distribution of collagen type I, III, IV, VII, and fibronectin, whereas collagen type V is found in higher amounts in periimplant tissues. The mucosa that encircles the implant has more of collagen and fewer fibroblasts as opposed to gingival tissues. The collagen fiber bundles run parallel to the titanium surface without attaching to it versus the perpendicular direction around the tooth. The supracrestal vascular topography surrounding the fixture is reduced and diversely arranged. Junctional epithelium is approximately 2 mm long. Encompassing the fixture is a tissue with low cellularity and vascularity resembling the cicatricial tissue that requires careful surgical handling. The periimplant mucosa mimics a scar tissue without a supracrestal fiber insertion into the cementum. Experimental studies have demonstrated that a minimum width of the periimplant mucosa is required for health. When the thickness of the periimplant mucosa is reduced, bone resorption occurs to reestablish the mucosal dimension that was required for protection of the underlying tissues. This physiological dimension was found to be similar in loaded and unloaded conditions. Implant systems that consisted of either one-part or two-part implants were found to exhibit similar soft tissue dimensions. Owing to the biologic differences between the periimplant and periodontal tissues [Table 1], the periimplant tissues are vulnerable to mucosal inflammation and bone loss. The long-term success of the implant is strongly determined by the periimplant soft tissue integrity., Soft tissue health around implants is primarily governed by the periimplant marginal bone and the periimplant papilla. Marginal gingiva is influenced by: Periodontal biotype, width of the facial bone, microstructure/macrostructure of the neck of the implant, microstructure of implant — abutment connection, abutment material and design, interimplant distance, implant abutment junction, abutment disconnection (one-stage or two-stage), and surgical technique adopted. Periodontal biotypes, both thick flat and thin scalloped biotypes respond in different ways to inflammation/surgery. Thin biotype is more prone to recession following procedures. Thick biotype is more stable and resistant to recession. 1.8 mm of the cortical bone width should be left all around to avoid crestal bone loss and recession. The factors that influence the position of the interimplant papilla are formation of the biological width and the distance of the interproximal bone. When the vertical distance from the contact point to the alveolar crest is <5 mm, papilla fill is almost 100%. A minimum of 3 mm of the interimplant distance should be maintained to avoid crestal bone loss and subsequent necrosis of the papilla., Full thickness flaps lead to an unavoidable bone resorption. An average 1 mm of alveolar height and width gets resorbed  and this may contribute to buccal soft tissue recessions on the facial aspect of implants that may dramatically disturb the aesthetic appearance. Reduction in the crestal bone height reduces the distance between the mucogingival junction (MGJ) and the bone crest and hence, reduces the dimensions of the keratinized tissue (KT). KT consists of dense, collagen-rich connective tissue lined by a keratinizing epithelium and the lamina propria is firmly attached to the periosteum of the bone. The lining mucosa on the other hand, is comparatively collagen-poor, covered by a nonkeratinized epithelium, and is attached to muscles/periosteum of the underlying bone by collagen and elastic fibers. If implants are surrounded by a sufficient width of attached/keratinized mucosa, the long-term prognosis of these implants is improved. Clinical parameters of inflammation were higher for those implants with a narrow zone (<2 mm) of keratinized mucosa. A wider mucosal band (>2 mm) is associated with less mucosal recession and periodontal attachment loss as compared with a narrow (<2 mm) band. The absence of adequate keratinized mucosa around implants supporting overdentures has been found to be associated with higher plaque accumulation, gingival inflammation, bleeding on probing, and mucosal recession. In patients exercising good oral hygiene and receiving regular implant maintenance therapy, implants with a reduced width of <2 mm of periimplant keratinized mucosa were more prone to lingual plaque accumulation and bleeding as well as buccal soft tissue recession over a period of 5 years. However, the importance of periimplant keratinized mucosa for the optimal health of an implant is still controversial., Controversies exists, as the literature is replete with studies claiming that the lack of attached gingiva does not jeopardize the maintenance of soft tissue health around dental implants, may not be crucial in maintaining the health of periimplant soft tissues, may not be associated with more bone loss  or that despite the presence of KT, periimplantitis may occur. Soft tissue remodeling occurs after implant placement. An apical displacement of the facial mucosa by 0.6 mm occurs within the first 6 months, with relatively little change thereafter. Thus, in situ ations, which require an appropriate dimension of KT soft tissue augmentation should be contemplated. A minimum of 3 mm of periimplant mucosa is required for a stable epithelial connective tissue attachment to form. If a minimal dimension of gingival tissue is not available, bone loss may occur to ensure the proper development of the biologic width. The transition of the alveolar mucosa to the periimplant mucosa is a difficult and a complex process. Linkevicious et al. in a human study found that positioning an implant 2 mm supracrestally did not prevent crestal bone loss if thin gingival tissues were present at the time of implant placement. Implants with thin tissue underwent additional bone loss interproximally versus the group with thick tissue pattern, which had significantly less bone loss. The conclusive findings of this study were that if initial tissue thickness was less (<2.5 mm), it could lead to bone loss of 1.45 mm within the first year of function. In thick tissues (>2.5 mm), marginal bone recession can be avoided. If the implant abutment junction is 2 mm or above the bone level, a negligible amount of bone loss (around 0.2 mm) would occur. Augmentation of thin mucosa should be considered before implant placement. The maturity of the soft tissue sealing around the implants promotes increase in papillary height within 2 years without any manipulation of the soft tissue. Loss of implant papilla is one of the most troubling dilemmas in implant dentistry. The “black triangle” around the implant-supported restoration causes not only phonetic difficulties and food impaction but also unpleasant aesthetics. Factors that may affect the appearance of the periimplant papilla are crestal bone height, interproximal distance, tooth form/shape, gingival thickness, and keratinized gingival width. The traditional abutment material of dental implants was commercially pure titanium due to its well-documented biocompatibility and mechanical properties. Aesthetic awareness in the implant dentistry, however, demands the development and use of other materials other than titanium in the abutment part of the implant. Abrahamsson et al. analyzed soft tissue healing in abutments made of titanium, gold alloy, dental porcelain, and Al2O3 ceramic. Gold alloy and dental porcelain failed to establish a soft tissue attachment while abutments made of titanium and ceramic formed an attachment with similar dimensions and tissue structures. In a subsequent animal experiment, however, it was reported that the periimplant soft tissue dimensions were not influenced if titanium or gold alloy was used in the marginal zone of the implant. In clinical studies, titanium and ceramic (Al2O3) abutments were compared regarding microbial sampling and soft tissue conditions and no differences between the materials were observed. Reformation of the biologic width around dental implants. The crest module is that part of the implant that receives the crestal stress to the implant after loading. After the implant is loaded, bone loss has been observed down to the first thread in many submerged implant systems, which have different distances from the implant platform to the first thread. It has been hypothesized that the bone loss may slow down at the first thread due to the changes in the shear force of the crest module to a component of compressive force caused by the thread itself. The implant neck design, either microtextured or macro-textured surface, may dictate the soft tissue integration. Pecora et al. in a 3-year postoperative result reported that the laser lock (LL) surface treatment enables the reduction of the crestal bone loss to 0.59 mm. Possible reasons are attributed to the reduction of the crestal bone stress through a combination of the implant design and surface modification. An animal study conducted to compare the surface design between turned, microtextured, and microgrooved implant neck designs revealed that the bone implant contact (BIC) and the overall soft tissue response were higher and better respectively in microgrooved implants versus the turned and microtextured implants. Soft tissue integrity is extremely important to be maintained during the healing phase of the two-stage submerged implant. Gingival tissues above the cover screw of a two-stage implant when perforated unintentionally during healing phase leads to an inflammatory reaction resulting in marginal bone destruction. Unintentional exposed implants loosen around 2 mm of the marginal bone. Healing abutment should be placed as soon as the perforation is diagnosed to avoid further bone loss. After placing the healing abutment, the mucosa is supported and raised by the abutment to a dimension that may reach the dimension of the biologic width. The presence of a transmucosal component of the two-piece implant system can lead to intentional/unintentional disconnections of the abutment. An unintentional abutment loosening will lead to a disruption of the soft tissue integration and to increased bone remodeling. It has been seen that repeated connections/disconnections induce apical repositioning of the soft tissues and marginal bone resorption. Soft tissue augmentation can be performed at different stages of implant therapy. They can be executed either before implant placement or at stage 2 implant surgery. The biology of the periimplant soft tissues warrants a careful manipulation of the soft tissues (flap design, reflection, coaptation, and suturing). Various modifications of the incisions/sutures during the implant placement and at the time of abutment placement conserve the soft tissue, enable stability of the flaps, and create papilla by coronal traction and thus, favor the soft tissue dimension. Modified Palacci technique (Grossberg 2001). T-shaped incision (Jemt T 1997). Beveled pericrestal incision (Sclar AG (2003). 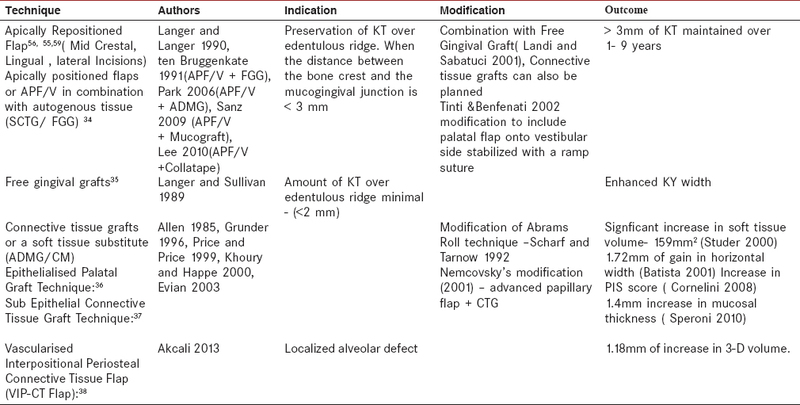 Ramp sutures (Tinti and Benfenati 2002). Use of tissue punch [Figure 1]. Buccal “envelope” technique for sliding a connective tissue graft on the labial aspect of the implant (Langer and Calagna 1982). The palatal or lingual based U-shaped peninsula flap (Miller PD Jr 1988). Papilla preserving modified roll technique (Dhir S 2014). Surgical approaches to augment the width of deficient mucosa are usually performed prior to implant placement or when undesired exposure of submerged implants occurs. Apically positioned flaps (APFs) — using a midcrestal/lingual positioned incision. APF/Vestibuloplasty (APF/V) in combination with autogenous tissue [subepithelial connective tissue graft (SCTG)/free gingival graft (FGG)]. SCTG technique or a soft tissue substitute [acellular dermal matrix graft (ADMG)/collagen matrix (CM)]. Vascularized interpositional periosteal connective tissue flap vascularized interpositional periosteal connective tissue (VIP-CT flap). APF/V plus FGG/SCTG has been documented as the most successful method to increase the width of KM. Similarly, APF/V plus collagen matrix demonstrated gain in KM but also less patient morbidity and surgery time as compared to APF/V plus SCTG.,, A midcrestal incision preserving KT available on the lingual side is suggested in order to elevate a double-layer flap. The inner layer of the flap was then sutured back, thus protecting the bone and allowing a recipient bed for a FGG while the external layer was apically sutured, thus deepening the vestibule [Figure 2]. FGGs are considered a reliable and efficacious approach for augmenting periimplant soft tissue defects and are most often utilized to increase the amount of KT around an implant. The major disadvantage of FGG is that the color and shade of the augmented recipient site do not often blend naturally with the surrounding tissues. Due to this disadvantage, FGG can be considered for “rescue” procedures to cover exposed implant threads. They can be safely used in patients with low smile lines. They are a preferred treatment option when extensive soft tissue augmentation is needed, or where the color of a FGG will not compromise the aesthetic appearance of the implant site. Vertical shrinkage of FGGs is a well-known clinical problem [Figure 3]. Interpositional free gingival graft (iFGG) is performed simultaneously at the time of implant placement to increase the amount of KT around the implants. This technique is based on the similar concept of “interpositional onlay graft” technique. A horizontal incision is made on the ridge crest. Full-thickness buccal and lingual flaps are elevated. Non-submerged implants are placed, and healing caps are connected following a standardized technique. The iFGG is harvested with an epithelium-connective part (E-C) and only connective tissue part (CT). The E-C and CT portions of the graft are determined; the graft is rectangular in shape in the frontal view and wedge-shaped in the cross-sectional view. The graft is positioned over the recipient bed, and the CT por­tion is inserted under the buccal flap and sutured to the buccal mucosa flap to promptly obtain a blood supply from the buccal flap and the underlying bone tissue. The E-C portion is tied around the healing caps using sling sutures. The graft is then closely connected to the lingual flap by using an interrupted suture to obtain primary closure in the interproximal area. Consequently, the buccal flap is positioned apically and fixed at the inferior border level of the E-C portion. These kinds of grafts achieve buccolingual and apicocoronal ridge augmentations. This procedure encounters minimal postoperative shrinkage of the grafted gingiva, deepening of the buccal vestibule, rapid revascularization of the grafted gingiva, shortening of the healing time, and prevention of graft shrinkage. The buc­cal flap and the recipient bed provided a copious blood supply. Subepithelial connective tissue graft (SCTG) procedures have now set the benchmark for the management of recession and soft tissue defects around natural teeth. However, there is ambiguity in the clinician's mind regarding the acceptance of SCTG around nonvital implants. This technique reconstructs an interdental papilla by elevating a facial envelope type of split-thickness flap followed by the harvesting of a suitable connective tissue graft from the tuberosity area and its placement under the flap in the interdental papilla area [Figure 4]a and [Figure 4]b. Animal experiments in dogs where 4 mm of thickness of connective tissue grafts harvested from the palate were placed at the buccal aspect of the bony wall in implants installed immediately after tooth extraction  showed that the connective tissue graft (CTG) partially preserved the hard tissues. Furthermore, the periimplant mucosa was significantly thicker and more coronally positioned. When a thinner tissue graft was used (1.5 mm) that was harvested from a different region (maxillary canine), a positive outcome was obtained. The tenets of soft tissue grafting with SCTG essentially remain the same as with soft tissue augmentation procedures around natural teeth. Recipient site should provide for graft vascularization. The recipient site must provide for rigid immobilization of the graft tissue. Adequate hemostasis must be obtained at the recipient site. The donor tissue must be large enough to facilitate immobilization and result in the desired volume augmentation after secondary contraction has occurred. This technique is preferred for large volume soft tissue augmentation and for simultaneous hard and soft tissue graftings. The procedure involves raising a subepithelial palatal connective tissue periosteal flap and rotating it into the prepared anterior recipient site. It is then positioned beneath the curvilinear recipient flap and rigidly immobilized with sutures. During initial healing, a customized tooth-borne provisional restoration is recommended. A thorough identification  of the existing hard/soft tissue deficiency is made. An appropriate decision to augment either the soft tissue alone or hard tissue alone or a combination of both has to be decided. The three most common intraoral donor sites for harvesting connective tissue grafts are the tuberosity, the single incision-deep palatal, and the FGG method-superficial palatal. Depending on the availability and the need, the donor area is opted. The quality of tissue from the tuberosity is generally denser but the quantity is limited. The initial incision may be slightly palatal rather than midcrestal to retain the KG. The incision is extended as sulcular incisions onto the adjacent teeth or as papillae sparing vertical releasing incisions passing to the level of the MGJ. A full-thickness flap is raised to allow access for surgical placement of the implant(s). The recipient bed should be kept well-hydrated. A partial-thickness flap is now reflected at the recipient area beyond the MGJ, leaving a layer of approximately 2-3 mm of connective tissue and periosteum intact. After placement of the implant, the harvested graft is adapted to the area. The graft should be adequate to provide soft tissue bulk at the level of the neck of the implant. This facilitates an aesthetic emergence profile. The tissue graft should be trimmed to resemble a semicircular cone and the apical aspect of the graft should not cover the proximal surfaces of adjacent teeth. Excessive bulk will hamper the aesthetic effect. The graft should be secured in the recipient bed utilizing a locking suture. The suture needle initially penetrates the palatal KT in a palatobuccal direction. The needle then passes through the mesial aspect of the graft employing a faciopalatal direction. The sequence is repeated for the distal portion of the graft and as the needle exits the palatal flap a second time, a knot is placed on the palatal side. The apex of the graft is stabilized in the connective tissue at the base of the flap so that the graft is stretched and well-adapted onto the recipient bed. The ideal suturing principles should be followed to enhance plasmatic circulation. The graft is then covered with the coronally advanced mucosal flap. It should be attempted to advance and secure the mucosal margin at least 2 mm coronally. In certain clinical situations, free connective tissue grafts are placed concomitantly in implants placed immediately into extraction sockets. Implants thus placed showed better bone levels, KT width, and patient satisfaction as compared with sites that received no CTG. Moreover, the use of connective tissue grafts has been proposed to compensate for ridge resorption that occurs after tooth extraction and immediate implant installation and thus, to improve the aesthetic outcomes. Autogenous grafts (SCTG) renders an increase in soft tissue thickness and better aesthetics compared to nongrafted sites. Mismatched mucosal color or texture, loss of interproximal papillae, and soft tissue recession are some of the common reasons for aesthetic failure. The soft tissue aesthetic outcome plays a vital role in achieving clinical aesthetic success. Pink aesthetic score (PES) or pink aesthetic score/white aesthetic score (PES/WES) can be employed to assess the aesthetic outcome of periimplant soft tissue. 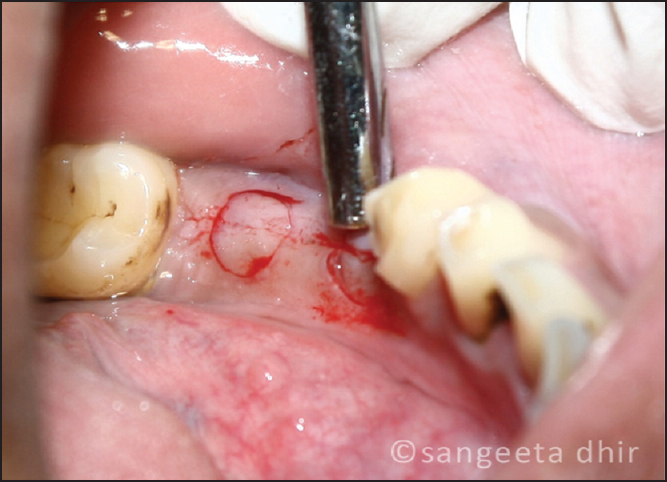 Connective tissue graft might be necessary in about one-third of the patients following immediate implant placement after tooth extraction to achieve steady improvement in PES score. However, CTG augmentation in Stage 2 implant surgery or after final restoration showed spontaneous improvements of PES score in the short-term follow-up but the PES score will likely revert to the baseline level when observed for at least 3 years after crown installation. Studies have shown that procedures using autogenous grafts (pedicle and FGGs) are successful and effective in increasing the width of KT. FGGs often result in compromised aesthetics (“patch-like area”). CTGs demonstrate better results in terms of aesthetics and color matching. Unfortunately these techniques are, however, associated with significant patient morbidity due to the wound at the palatal donor site and in certain clinical situations the available donor tissue may be insufficient. To compensate for these inadequacies, soft tissue substitutes have been used. Among these dermal allografts, such as the acellular dermal matrix graft  and human fibroblast-derived dermal substitute have been used for the palatal donor tissue. Allograft materials resulted in increase in width of KT. Since allografts are derived from human cadavers, it may present ethical concerns and the possible risk of disease transmission. To avoid the abovementioned shortcomings, collagen membrane (CM) of porcine origin that has already been used with oral wound-healing/around natural teeth has been tried. Mucograft, a collagen matrix of porcine origin successfully increased the width of KG and also improved the aesthetic outcomes but decreased postoperatory morbidity comparable with autogenous CTGs. The mechanism of action is by acting as a scaffold that allows the ingrowth and repopulation of fibroblasts, blood vessels, and the epithelium from surrounding tissues, eventually being transformed into KT. In repeated clinical trials, these CMs have shown similar results when compared with the gold standard (subepithelial CTGs). Its use in large mucosal defects has also reported good clinical outcomes. Xenogeneic CM, when used as a soft tissue substitute aiming to increase the width of KM around dental implants in the mandible was as effective and predictable as the connective tissue autograft. A modification of the roll technique (Abrams 1980) can be performed at the time of the second surgical procedure. A ''trap-door approach'' on the alveolar ridge over the palatal connective tissue is recommended to preserve the epithelium. The mobile pedicle connective tissue flap is buccally rotated to increase soft tissue thickness. A subsequent modification of this technique that avoided buccal releasing incisions is used an intrasulcular incision on the adjacent teeth to improve the aesthetic outcomes. The use of a rotated split-thickness palatal flap was proposed to obtain primary soft tissue closure over implants placed into fresh extraction sockets and to increase the width of KT around implants at the time of  implant exposure using a simultaneous apically positioned flap. Papilla preserving modified palatal roll flap design helps in bulking the KT by saving the interproximal papilla. This modified design also resulted in quick healing of the palatal donor site [[Figure 5]. Nemcovsky (2001) proposed an advanced papillary flap combined with a CTG to augment the soft tissue in the interdental area. Tinti and Parma-Benfenati (2002) proposed an apically positioned flap from the palatal side to the vestibular side at the time of second-stage surgery. This flap was stabilized with a ramp mattress suture technique in a more coronal position at the buccal site; CTG was used to cover interimplant bone tissue. A few weeks following the first surgical procedure, a buccal-scalloped gingivectomy was performed around the buccal surface of the abutments to create a scalloped gingival margin and interproximal papillae only in the vestibular area. Lengthening of the contact area. Use of custom tooth form healing abutments. Repeated scaling and curettage of the interdental papilla region every 15 days for 3 months. Use of gingiva colored porcelain. The formation of the biological width and maturation of the barrier function around transmucosal implants requires 6-8 weeks of healing. The established periimplant soft connective tissue resembles a scar tissue in composition, fiber orientation, and vasculature. The periimplant junctional epithelium may reach a greater final length under certain conditions such as implants placed into fresh extraction sockets versus conventional implant procedures in healed sites. The careful management of soft tissue around implants is universally preferred even though there is no consensus on the importance of KT. Various surgical techniques and modification to incisions/suturing have been suggested to enhance the soft tissue dimensions around an implant. Currently, the preferred options are CTG, APF, and FGG., The outcomes of various techniques are discussed in [Table 2]. An implant needs to achieve more than osseointegration for a successful outcome. Esposito et al. (2007) report that there is no sufficient evidence to recommend increase in KT or to indicate specific techniques for periimplant soft tissue management. Although scientific evidence in most part is lacking, soft tissue augmentation at implant sites may need to be considered in some clinical situations. Future implant site preparation (deficient edentulous site or extraction socket) represents the opportunity to preserve or restore hard or soft tissue volume prior to implant placement. Innovative flap designs can be used to achieve better surgical and aesthetic results. Soft tissue augmentation either at implant placement, or at the second stage or after the implant placement as rescue operation can be predictably achieved with APF, APF/V, FGG, SCTG, and their modifications. Lengthening of the contact area to reduce the black triangles and to mask the loss of interdental papilla and use of gingival colored porcelain on the cervical portions of abutments or restorations may be undertaken whenever surgical reconstruction is not feasible. Implants with rough coated crest module/collar design are said to result in reduced crestal bone loss compared to smooth collar design ensuring better health of soft tissue in the long term. “Platform switching” limits the bone loss that occurs around the coronal aspect. The early use of custom tooth form healing abutments or provisional restorations at the time of implant placement or exposure is recommended. Owing to the heterogeneity of the documented studies, there is limited evidence on the potential benefit of soft tissue augmentation procedures and their influence on the aesthetic outcomes of implant therapy. Well-designed RCTs with long-term follow up would possibly help to evaluate the potential benefit of periimplant soft tissue management and its influence on the aesthetic outcome of implant therapy. Lekholm U, Gunne J, Henry P, Higuchi K, Lindén U, Bergström C, et al. Survival of the Brånemark implant in partially edentulous jaws: A 10-year prospective multicenter study. Int J Oral Maxillofac Implants 1999;14:639-45. Hansson HA, Albrektsson T, Brånemark PI. Structural aspects of the interface between tissue and titanium implants. J Prosthet Dent 1983;50:108-13. Gould TR, Westbury L, Brunette DM. Ultrastructural study of the attachment of human gingiva to titanium in vivo. J Prosthet Dent 1984;52:418-20. Listgarten MA, Lai CH. Ultrastructure of the intact interface between an endosseous epoxy resin dental implant and the host tissues. J Biol Buccale 1975;3:13-28. Chavrier CA, Couble ML. Ultrastructural immunohistochemical study of interstitial collagenous components of the healthy human keratinized mucosa surrounding implants. Int J Oral Maxillofac Implants 1999;14:108-12. Berglundh T, Lindhe J, Ericsson I, Marinello CP, Liljenberg B, Thomsen P. The soft tissue barrier at implants and teeth. Clin Oral Implants Res 1991;2:81-90. Berglundh T, Lindhe J, Jonsson K, Ericsson I. The topography of the vascular systems in the periodontal and peri-implant tissues in the dog. J Clin Periodontol 1994;21:189-93. Berglundh T, Lindhe J. Dimension of the periimplant mucosa. Biological width revisited. J Clin Periodontol 1996;23:971-3. Siar CH, Toh CG, Romanos G, Swaminathan D, Ong AH, Yaacob H, et al. Peri-implant soft tissue integration of immediately loaded implants in the posterior macaque mandible: A histomorphometric study. J Periodontol 2003;74:571-8. Abrahamsson I, Berglundh T, Wennstrom J, Lindhe J. The peri-implant hard and soft tissues at different implant systems. A comparative study in the dog. Clin Oral Implants Res 1996;7:212-9. Kan JY, Rungcharassaeng K, Umezu K, Kois JC. Dimensions of peri-implant mucosa: An evaluation of maxillary anterior single implants in humans. J Periodontol 2003;74:557-62. Zigdon H, Machtei EE. The dimensions of keratinized mucosa around implants affect clinical and immunological parameters. Clin Oral Implants Res 2008;19:387-92. Maynard JG Jr, Wilson RD. Physiologic dimensions of the periodontium significant to the restorative dentist. J Periodontol 1979;50:170-4. Spray JR, Black CG, Morris HF, Ochi S. The influence of bone thickness on facial marginal bone response: Stage 1 placement through stage 2 uncovering. Ann Periodontol 2000;5:119-28. Tarnow DP, Cho SC, Wallace SS. The effect of inter-implant distance on the height of inter-implant bone crest. J Periodontol 2000;71:546-9. Cardaropoli G, Lekholm U, Wennström JL. Tissue alterations at implant-supported single-tooth replacements: A 1-year prospective clinical study. Clin Oral Implants Res 2006;17:165-71. Burkhardt R, Joss A, Lang NP. Soft tissue dehiscence coverage around endosseous implants: A prospective cohort study. Clin Oral Implants Res 2008;19:451-7. Ten Cate ARAR. Oral histology: Development, structure, and function/A.R. Ten Cate. United States: St. Louis: Mosby-Year Book; c1994. p. 28-36. Adibrad M, Shahabuei M, Sahabi M. Significance of the width of keratinized mucosa on the health status of the supporting tissue around implants supporting overdentures. J Oral Implantol 2009;35:232-7. Schrott AR, Jimenez M, Hwang JW, Fiorellini J, Weber HP. Five-year evaluation of the influence of keratinized mucosa on peri-implant soft-tissue health and stability around implants supporting full-arch mandibular fixed prostheses. Clin Oral Implants Res 2009;20:1170-7. Thoma DS, Buranawat B, Hammerle CH, Held U, Jung RE. Efficacy of soft tissue augmentation around dental implants and in partially edentulous areas: A systematic review. J Clin Periodontol 2014;41(Suppl 15):S77-91. Chung DM, Oh TJ, Shotwell JL, Misch CE, Wang HL. Significance of keratinized mucosa in maintenance of dental implants with different surfaces. J Periodontol 2006;77:1410-20. Wennstrom JL, Derks J. Is there a need for keratinized mucosa around implants to maintain health and tissue stability? Clin Oral Implants Res 2012;23(Suppl 6):136-46. Karring T, Ostergaard E, Löe H. Conservation of tissue specificity after heterotopic transplantation of gingiva and alveolar mucosa. J Periodontal Res 1971;6:282-93. Wennstrom J, Lindhe J. Role of attached gingiva for maintenance of periodontal health. Healing following excisional and grafting procedures in dogs. J Clin Periodontol 1983;10:206-21. Cairo F, Pagliaro U, Nieri M. Soft tissue management at implant sites. J Clin Periodontol 2008;35:163-7. Wennstrom JL, Bengazi F, Lekholm U. The influence of the masticatory mucosa on the peri-implant soft tissue condition. Clin Oral Implants Res 1994;5:1-8. Roos-Jansaker AM, Renvert H, Lindahl C, Renvert S. Nine- to fourteen-year follow-up of implant treatment. Part III: Factors associated with peri-implant lesions. J Clin Periodontol 2006;33:296-301. Linkevicius T, Apse P, Grybauskas S, Puisys A. The influence of soft tissue thickness on crestal bone changes around implants: A 1-year prospective controlled clinical trial. Int J Oral Maxillofac Implants 2009;24:712-9. Chow YC, Wang HL. Factors and techniques influencing peri-implant papillae. Implant Dent 2010;19:208-19. Oh TJ, Yoon J, Misch CE, Wang HL. The causes of early implant bone loss: Myth or science? J Periodontol 2002;73:322-33. Jung YC, Han CH, Lee KW. A 1-year radiographic evaluation of marginal bone around dental implants. Int J Oral Maxillofac Implants 1996;11:811-8. Pecora GE, Ceccarelli R, Bonelli M, Alexander H, Ricci JL. Clinical evaluation of laser microtexturing for soft tissue and bone attachment to dental implants. Implant Dent 2009;18: 57-66. Van Assche N, Collaert B, Coucke W, Quirynen M. Correlation between early perforation of cover screws and marginal bone loss: A retrospective study. J Clin Periodontol 2008;35:76-79. Abrahamsson I, Berglundh T, Lindhe J. The mucosal barrier following abutment dis/reconnection. An experimental study in dogs. J Clin Periodontol 1997;24:568-72. Thoma DS, Muhlemann S, Jung RE. Critical soft-tissue dimensions with dental implants and treatment concepts. Periodontol 2000 2014;66:106-18. Boyne PJ. Advances in preprosthetic surgery and implantation. Curr Opin Dent 1991;1:277-81. Langer B, Sullivan DY. Osseointegration: Its impact on the interrelationship of periodontics and restorative dentistry: Part I. Int J Periodontics Restorative Dent 1989;9:84-105. Sullivan HC, Atkins JH. The role of free gingival grafts in periodontal therapy. Dent Clin North Am 1969;13:133-48. Langer B, Sullivan DY. Osseointegration: Its impact on the interrelationship of periodontics and restorative dentistry. II. Int J Periodontics Restorative Dent 1989;9:165-84. Sclar AG. Strategies for management of single-tooth extraction sites in aesthetic implant therapy. J Oral Maxillofac Surg 2004;62(Suppl 2):90-105. Landi L, Sabatucci D. Plastic surgery at the time of membrane removal around mandibular endosseous implants: A modified technique for implant uncovering. Int J Periodontics Restorative Dent 2001;21:280-7. Sohn JY, Park JC, Cho KS, Kim CS. Simultaneous placement of an interpositional free gingival graft with nonsubmerged implant placement. J Periodontal Implant Sci 2014;44:94-99. Caneva M, Botticelli D, Vigano P, Morelli F, Rea M, Lang NP. Connective tissue grafts in conjunction with implants installed immediately into extraction sockets. An experimental study in dogs. Clin Oral Implants Res 2013;24:50-6. Allen EP, Miller PD Jr. Coronal positioning of existing gingiva: Short term results in the treatment of shallow marginal tissue recession. J Periodontol 1989;60:316-319. Covani U, Marconcini S, Galassini G, Cornelini R, Santini S, Barone A. Connective tissue graft used as a biologic barrier to cover an immediate implant. J Periodontol 2007;78:1644-9. Wiesner G, Esposito M, Worthington H, Schlee M. Connective tissue grafts for thickening peri-implant tissues at implant placement. One-year results from an explanatory split-mouth randomised controlled clinical trial. Eur J Oral Implantol 2010;3: 27-35. Belser UC, Schmid B, Higginbottom F, Buser D. Outcome analysis of implant restorations located in the anterior maxilla: A review of the recent literature. Int J Oral Maxillofac Implants 2004;19(Suppl):30-42. Cosyn J, Raes M, Packet M, Cleymaet R, De Bruyn H. Disparity in embrasure fill and papilla height between tooth- and implant-borne fixed restorations in the anterior maxilla: A cross-sectional study. J Clin Periodontol 2013;40:728-33. Gu YX, Shi JY, Zhuang LF, Qiao SC, Xu YY, Lai HC. Esthetic outcome and alterations of soft tissue around single implant crowns: A 2-year prospective study. Clin Oral Implants Res 2015;26:909-14. Dorfman HS, Kennedy JE, Bird WC. Longitudinal evaluation of free autogenous gingival grafts. A four year report. J Periodontol 1982;53:349-52. Roccuzzo M, Bunino M, Needleman I, Sanz M. Periodontal plastic surgery for treatment of localized gingival recessions: A systematic review. J Clin Periodontol 2002;29(Suppl 3):178-96. Imberman M. Gingival augmentation with an acellular dermal matrix revisited: Surgical technique for gingival grafting. Pract Proced Aesthet Dent 2007;19:123-8. McGuire MK, Scheyer ET, Nunn ME, Lavin PT. A pilot study to evaluate a tissue-engineered bilayered cell therapy as an alternative to tissue from the palate. J Periodontol 2008;79:1847-56. Hammerle CH, Jung RE, Feloutzis A. A systematic review of the survival of implants in bone sites augmented with barrier membranes (guided bone regeneration) in partially edentulous patients. J Clin Periodontol 2002;29(Suppl 3):226-33. Sanz M, Lorenzo R, Aranda JJ, Martin C, Orsini M. Clinical evaluation of a new collagen matrix (Mucograft prototype) to enhance the width of keratinized tissue in patients with fixed prosthetic restorations: A randomized prospective clinical trial. J Clin Periodontol 2009;36:868-76. Jung RE, Hürzeler MB, Thoma DS, Khraisat A, Hämmerle CH. Local tolerance and efficiency of two prototype collagen matrices to increase the width of keratinized tissue. J Clin Periodontol 2011;38:173-9. Herford AS, Akin L, Cicciu M, Maiorana C, Boyne PJ. Use of a porcine collagen matrix as an alternative to autogenous tissue for grafting oral soft tissue defects. J Oral Maxillofac Surg 2010;68:1463-70. Barone R, Clauser C, Grassi R, Merli M, Prato GP. A protocol for maintaining or increasing the width of masticatory mucosa around submerged implants: A 1-year prospective study on 53 patients. Int J Periodontics Restorative Dent 1998;18:377-87. Nemcovsky CE, Artzi Z. Split palatal flap. II. A surgical approach for maxillary implant uncovering in cases with reduced keratinized tissue: Technique and clinical results. Int J Periodontics Restorative Dent 1999;19:385-93. Dhir S. Papilla preserving modified roll technique for stage 2 soft tissue augmentation. J Indian Soc Periodontol 2014;18: 512-5. Tinti C, Benfenati SP. The ramp mattress suture: A new suturing technique combined with a surgical procedure to obtain papillae between implants in the buccal area. Int J Periodontics Restorative Dent 2002;22:63-9. Nordland WP, Tarnow DP. A classification system for loss of papillary height. J Periodontol 1998;69:1124-6. Shapiro A. Regeneration of interdental papillae using periodic curettage. Int J Periodontics Restorative Dent 1985;5:26-33. Kamalakidis S, Paniz G, Kang KH, Hirayama H. Nonsurgical management of soft tissue deficiencies for anterior single implant-supported restorations: A clinical report. J Prosthet Dent 2007;97:1-5. Cosgarea R, Gasparik C, Dudea D, Culic B, Dannewitz B, Sculean A. Peri-implant soft tissue colour around titanium and zirconia abutments: A prospective randomized controlled clinical study. Clin Oral Implants Res 2015;26:537-44. Grunder U. Aesthetic success or failure in implant-supported anterior restorations. Pract Periodontics Aesthet Dent 1996;8:830, 833. Bianchi AE, Sanfilippo F. Single-tooth replacement by immediate implant and connective tissue graft: A 1-9-year clinical evaluation. Clin Oral Implants Res 2004;15:269-77. Dhir S, Mahesh L, Kurtzman GM, Vandana KL. 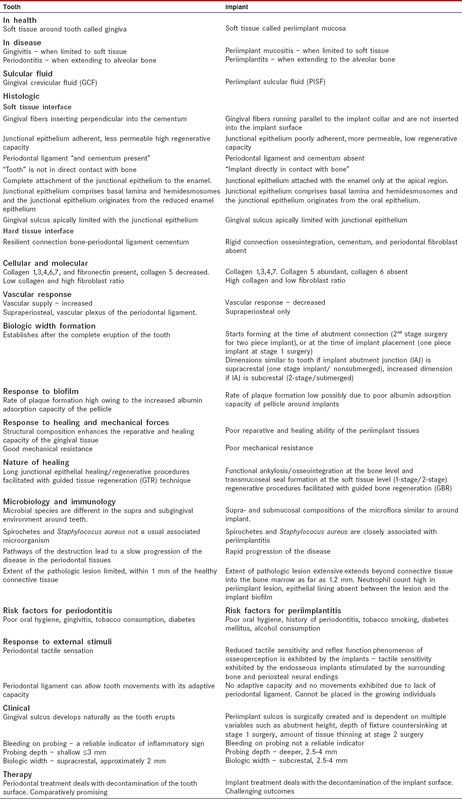 Peri-implant and periodontal tissues: A review of differences and similarities. Compend Contin Educ Dent 2013;34:e69-75.